People born specifically on the 18th of October are imagined to be very inquisitive, persuasive and alert but more energetic than most Librans. The ruling astrological planet for this particular day is Mars making you naturally purposeful, diplomatic, charming and quite fearless. If you have this birthday your visionary temperament is tactful and cooperative and you will usually be a great listener. Your kindhearted unselfish nature is resolute and fairminded yet prone to be a tad opinionated at times too. Fairly confident and ambitious you prefer to feel in control of your life and really enjoy having fun. Honest and self sufficient you seem to gain much satisfaction from solving problems and are ordinarily good at seeing both sides to an argument. Individuals with an October the eighteenth birthday may strongly crave the approval of others but their optimism, determination, focus and eloquence makes them destined to go far. Your creative side is likely to appreciate fine food, wine, artwork and fashion. The strong ambition attributed to a person born on the eighteenth of October often gives you a preference to work in a prominent important position. Analytical and intelligent you are quick to learn and usually prepared to study or train for favored jobs. Although you appear to dislike working in the background your sense of purpose and clever charm and tact guide you to be a wonderful co-worker. It is unusual for you to encounter financial issues as you tend to keep a careful eye on budgeting and take it seriously without being mean. Plenty of patience lets you normally save instead of borrowing for expensive or special items. For a Libra, the person born on the eighteenth day of October is typically someone who feels completely comfortable in a long term one to one relationship. You possess a mature serious attitude to love and romance and will make every effort to keep a soul mate happy but you can be sometimes overly protective. Incredibly loving and passionate you will shower a partner with affection and make them feel good about themselves. Your touch of romantic idealism directs you to be caring and giving and encourages you to try and avoid disagreement or confrontation. Home life is a high priority despite your ambitiousness and your artistic flair comes in handy for expressing your unique style and imprinting it on your surrounding living space. Seductive but also shy about your lusty sexual needs you are always keen to please in the bedroom and will usually favor privacy for playful intimacy. Lots of motivation to look and feel good can help sustain the usual healthiness experienced by those born on October 18th. You are likely to be sporty and competitive so fond of healthy exercise and eating a sensible healthy diet. With regular sleep patterns this motivated health care stance also helps you acquire the emotional stability you require. Learning to say No more often should benefit overall well being as you have the tendency to quickly become stressed by too many responsibilities. People born on this day can soon be addicted to caffeine, nicotine or alcohol therefore these type of stimulants should ideally be minimized. Your main strengths of character are displayed in your intense curiosity and persuasiveness guiding you to be inspirational, imaginative and forthright. These positive traits are backed up by your accompanying fortes of diplomacy and honesty giving you a fair balanced perspective to base decisions on. The personality weaknesses for those born on October 18th seem to come to the surface more frequently if you allow yourself to overload your body or mind. In these particular circumstances you become overstressed and may act uncharacteristically bothered, aloof and outspoken. Relaxation is the key to minimizing this negativity. 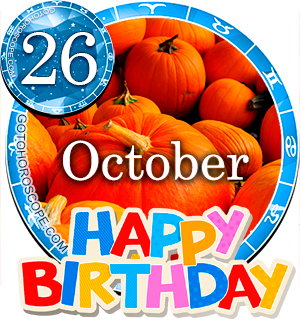 Being born on the 18th of October gives you ample energy and a lack of fear that means there is not much you cannot accomplish. Organized and precise regarding detail you will be especially focused and determined when it comes to attaining your greatest wishes. Your self sufficiency may make it hard to willingly accept assistance of any kind in the pursuit of a specific personal goal. Dreams are inclined to reflect and boost your expectation of favorable outcomes. Dreaming of future successes in anything you attempt keeps you keenly motivated, extra observant for opportunities to shine and positively hopeful. As you were born on the eighteenth day of the month the one and eight in your birth date summate to a Root number of Nine. This numerical reference to your birthday has the keyword 'Seeker' highlighting the intensity of your desire to know and understand everything you experience. The 18th Tarot card in the Major Arcana symbolizing the Moon is associated with your birthday. This mystic connection urges you to be a bit more trusting of your instinctive intuition as it is an excellent guide. The lucky gemstone for October the eighteenth birthdays is a Bloodstone, to be worn for a potential increase in courage, happiness and vitality. The influential planet Venus is thought to be astrologically accountable for the probabilities of Libra personalities. The actual day you were born on, the eighteenth of October is ruled over by Mars's authority. Your talented creativity, sense of cooperation and ability to problem solve make you a useful person to know. Your controlled strong will and penchant for total honesty keep you on the right track for making steady progress. If you can conquer stress build up by relaxing regularly you should be able to maintain your usual equipoise and impartiality. A finalizing thought for people born on October the 18th advises you to not be so hard on yourself, know your limits as exceeding them could be detrimental. Are these things even correct or just guess work? My brother and I were born on the 18th October but on different year he is actually 4 years older than I am. We share absolutely nothing in common yet we are both Libra, the same month the same day! How come? I call bs on horoscope! This describes just about everyone, it's just using vauge descriptions. This Is Spot On my personality. I read this atleast 20 times. Best Site so far. How can it be so true? I've read a lot of horiscope. This is by far the best site. So accurate and helpful . I will us this on my daily lives. Right on the money about me. This is truly unbelievable. All I can say is wow! This is so me.